I just recently... as in a week ago got dreadlocks. I love how they look... but I now have small inflamed bumps all over my scalp and I am not sure what to do. I cannot tell if it is allergies... or merely irritation of the scalp. Please help me!!! They are located around the edges of my scalp where my hairline ends and about an inch inward. Thank you! I get them too. What it is is scalp irritation from the tension when you get them done or resisted. Mine usually start at the back of my head where all the fine little hairs are. The only reason I know its from irritation and nothing to do with the dreadsis because I used to get them when I got my hair braided too. I usually put a TINY bit of sulfur8 or some type of medicated ointment on them to keep my scalp a little moist and they clear up In a few days unless you scratch them off. Then they scab and that will irritate you for weeks because as the scab heals it itches worse than the bumps. My head is shaved on the side and in the back and along the edges I have red painful itchy bumps, I ended up like losing my mind because it was so itchy. I pulled my dreads into a very tight bun and felt out the roots to find hairs that were pulled tight with no lax to speak of and cut them. Let me tell you something about instant relief. Then I put coconut oil all over my scalp, which took away the itching and soothed the burning a lot, I left it in over night then used 100% natural body to clean my hair the next day and I haven't had a problem since, I'm not a professional but this worked for me. So if all else fails I would say just cut the really strained hairs off! used to have this problem! I figured out mine was caused by allergy to products--even ones i used previously! when you have dreads your hair doesn't get rinsed as well as before, so the products stay close to your scalp. I have found that even "all natural" products have some chemicals in them, so i now use 100% pure. I just buy it online and ALL the ingredients are natural and good for your skin!! I love it and it is very rare that i get sores from my dreads now :) you can use any of the cleaning products on your dreads too--not just the shampoo! I am experiencing the same thing. 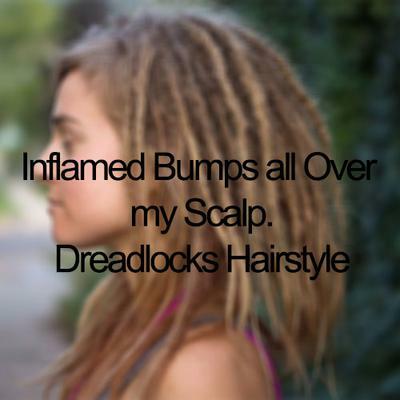 new dreads... red inflamed painful bumps, but no products except for aloe vera, and i was never allergic to it before. I actually feel better now. Hi, I'm experiencing exactly the same thing! I used DreadHeadHQ products to dread my hair 4 days ago, and have got red bumps all around my hairline where the dreads are. I believe it's an allergy, but don't know. If you get any answers, please let me know! Tension - Sometimes when hair is pulled too tightly scalp develop itchy bumps. This is caused by tension on hair follicle and scalp. Its normally a temporary reaction appear after 2-3 days of application and should go away after a week time. Cleansing - Its important to wash your dreadlocked hair and scalp regularly with the right dreadlock shampoo. Many people having a wrong impression of dreadlocks and they think, just because they have dreadlocks, they don't have to wash their hair as they used to. That could lead to many scalp problems. Allergy - Your scalp was introduced to new type of product(s) never used before. Dreadlocks stylists use Dread Wax or Dread Cream to style the hair and some of these products contain petroleum and fragrance. If you have history of allergy, you better talk with your dreadlocks specialist and get a list of ingredients.